This window displays your computer's shares which can be accessed by remote users. Change share properties by selecting the context-menu item Edit (double-click). 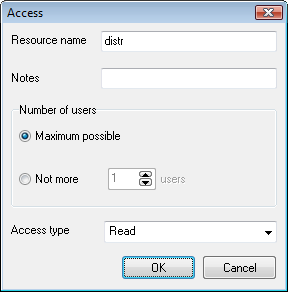 Edit the share properties on the Access window that appears (Fig. 2). Close shares by clicking the button Delete. Create new shares by clicking the Add button and then selecting a folder on the folder tree. Fig. 1: The Shares window. Fig. 2: The Access window. LANState has some basic share access monitoring functions. For more serious usage, please use our special product made for the share access monitoring: 10-Strike Connection Monitor.